Proven smooth running and reliable clutchless drive. 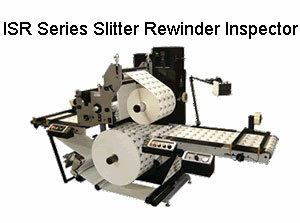 Rewinds numerous substrates including thin, unsupported films. Adjustable splice table at unwind. Adjustable electronic web tension control. Choice of either left-right or right-left web path. 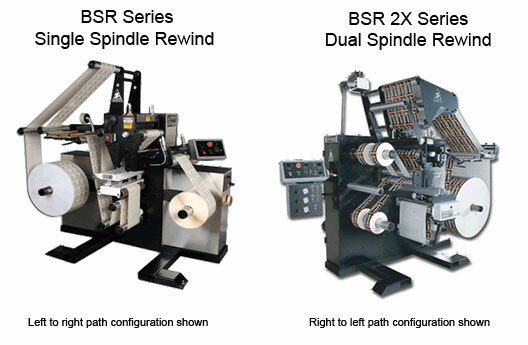 Reversible rewind(s) for over or under winding. 40" (1016mm) max. diameter unwind with heavy-duty pneumatic disc brake. 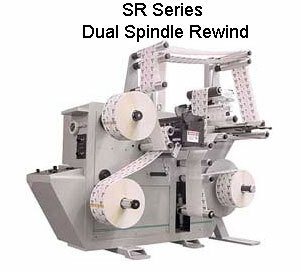 Spead roller for separating finished rolls at rewind. Forward inspection tower with synchronized strobe. 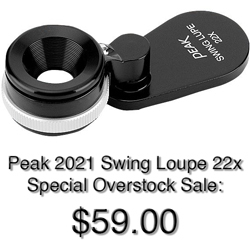 PLC controlled tension with Touch-Screen for precise "Set and Forget" web tension. Inspection table for mounting ancillary imprinting and inspecton equipment. Electronic missing label flag detection. Lamination tower with top-rider for applying overlaminate material to web. Pneumatically activated top-rider rolls for unsupported film and large diameter rewinding. Pneumatically inflatable 26" waste wind-up for matrix and liner removal.